So far this season, snowfall totals have ranged from less than 10 inches to more than 60 inches. Last winter, the mid-Atlantic states were pummeled by successive snowstorms. This season, the pattern shifted, and the I-95 corridor from New York to Boston has been buried by the December 26, 2010 Nor’easter and almost weekly storms since early January. Snowfall totals in many locations have exceeded the seasonal averages by more than 10 inches. 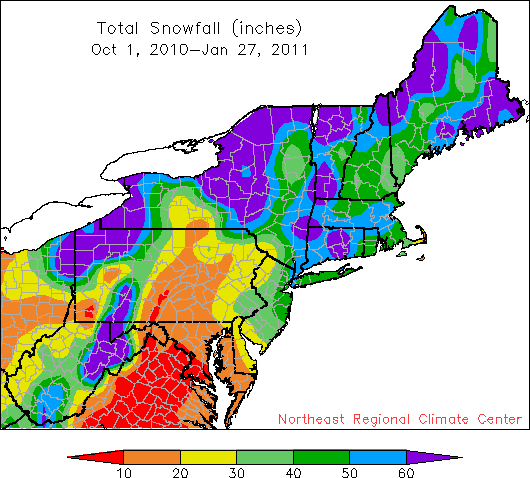 Not all parts of the Northeast have been snowier than normal. Normally snowy Caribou, ME’s total of 39.9 inches as of January 27 is 57.7 inches less than their normal total to date and 71.5 inches less than their seasonal average.